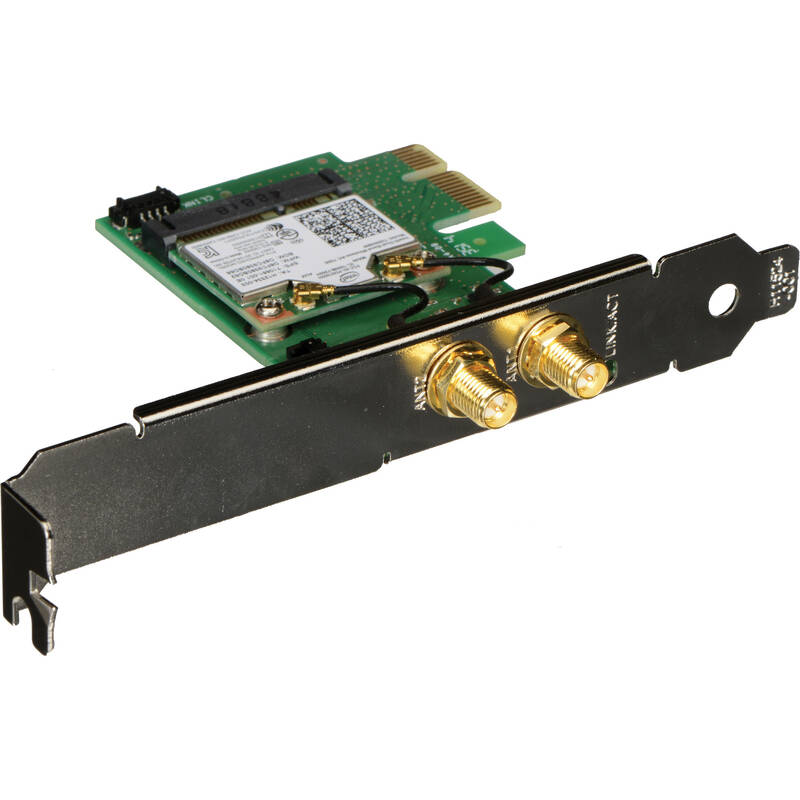 The Dual Band Wireless-AC 7260 Network Adapter for Desktop from Intel provides Wi-Fi speeds up to 867 Mb/s. It features 64-bit and 128-bit WEP, AES-CCMP, and TKIP encryption. Delivers faster Wi-Fi speeds (up to 867 Mb/s) than 802.11n, with 433 Mb/s bandwidth per stream, more capacity for more users (extended channel bonding 80 MHz), broad coverage and battery life (data transmit efficiencies reduce power consumption). Actual platform battery life savings will vary depending on your specific operating system, hardware and software configurations. Watch your PC or Ultrabook content instantly without wires with optimal image clarity and sound. Intel Wireless Display gives you an entertainment upgrade. Stream movies, videos, games, photos, connect with friends, and more with this. Intel Smart Connect Technology require a select Intel processor, Intel software and BIOS update, Intel Wireless adapter, and Internet connectivity. It supports Intel's hardware-based security and management features built into Intel Core vPro processors and chipsets that enable IT to manage PCs virtually anywhere, anytime while reducing deployment costs, improving security and ROI. Box Dimensions (LxWxH) 6.1 x 5.8 x 2.0"
Dual Band Wireless-AC 7260 Network Adapter for Desktop is rated 4.9 out of 5 by 9. Rated 5 out of 5 by Yuri from Works very well on my Linux workstation I needed a card for my home office Linux workstation which can work 24/7. My workstation runs a web server, it streams DLNA content and keeps both incoming and outgoing connections up around the clock. This card seems to do the job well. It was a plug and play install in my Ubuntu 14.04 both the WiFi and Bluetooth. External antenna makes a big difference when it comes to signal quality, make sure to position it for best signal strength. I have 3 walls and 25 feet between my workstation and the router (Netgear R7000 running DD-WRT - a great router by the way). When I adjusted the antenna connection speed went up from 40Mbps to 130Mbps. Rated 5 out of 5 by TrashTalker from Fix spotting WiFI The AC-7260 was being used at a few fortune 100 companies I visited, so I gave it a try. The AC-7260 replaced an older WiFi card that started having issues. The AC-7260 replaced a TP-Link (WDM4800) PCI workstation in the basement. WDM4800 connects with 100% signal strength and refuses to stay connected. So, old WiFi (802.11b or n) may have issues in basements, near WiFi obstructions (metal desks,mirrors..) or isolated locations. The The AC-7260 was being used at a few fortune 100 companies I visited, so I gave it a try. is not impacted by the desk and basement location.Two thumbs up for the AC-7260. Rated 5 out of 5 by Anonymous from A superb solution for your desktop I use this card as wireless solution for my desktop, because of inconvenience of wired setup. It replaced a Rosewill 802.11g card. Even though my Internet speed is well below saturation of the old 802.11g card and the distance between the router and the computer is just several feet, the improvements were immediately noticeable in page load and computer responsiveness. I connected the Bluetooth, however have not tested its function yet. Windows 10 recognized and installed drivers by itself, did not have to do a thing. Overall excellent experience, highly recommended. Rated 4 out of 5 by Ronie from Pretty good for the most part The router settings and frequency have to be right and the roaming aggressiveness might have to be toned down. It's a little more stable than what a good usb adapter would be but it has just about the same range and costs more. I can't figure out how to get the bluetooth to work and it doesn't quite fit perfectly on my case without unscrewing the screws on the green chip. I think bluetooth is pretty much broken. It works good and crashes a lot less than by usb adapter, I think it would be a lot more worth it if bluetooth worked. Rated 5 out of 5 by Anonymous from It's Intel. It just works. Upgraded my network with new AC router. AC WiFi is finally fast enough to really use. My Rokus work without Ethernet cables! I realized (duh) that I could connect my desktop with Wifi too. Just plugged this adapter in, Win 10 found the driver and it worked, and it seems to be pretty fast. Getting rid of cables is a good thing! It seems the AC 7260 is pretty popular too. Rated 5 out of 5 by vkras from Works great out of the box With the latest drivers everything works as you would expect from Intel. No dropped packets, not sudden disconnects as I've seen from 2 other brands I tried before this one. Rated 5 out of 5 by Bartosz from Just works. Intel has best NIC chipsets Plug & Play install. Got drivers from Intel's site. Excellent reception. Rated 5 out of 5 by Glenn from Good price, good product Easy to install. Works great. Is the Intel AC-7260 support Miracast with Intel 3rd Gen Core i5 &amp; Windows 10? The Intel Dual Band Wireless-AC 7260 supports Intel Wireless Display (WiDi) unfortunately it does not support Mircast. What is the warranty period on this item? I have not been able to find the answer on Intel's site either. It says 3 year limited warranty on the box, and to see details on enclosed DVD-ROM . I don't have a DVD drive in my computer so can't check the details right now. Is the Intel AC-7260 compatible to Optiplex 7010 low profile chassis? Does this work for Dell inspiron 560 F3F7NL1? The Inspiron 560 does not appear to provide an internal PCIe slot. If it has one, assuming it is supported by the motherboard, Windows 10 has compliant drivers. The Intel WiFi is an excellent device which delivers 200 Mbits 802.11ac at whatever frequency your gateway provides, 2.4 or 5 Ghz. But the Inspiron appears based upon a non-expandable motherboard. Still, I'd look inside if you know what your are looking for, or know someone who does. Will this fit in the Lenovo ThinkCentre M93p 10A9?